Her heart, like a clock, counted the seconds left. The wheel whirred, blurring beneath the tick, tock of her heart. The defences were readied, the fighters in position. She was steady—steady as a rock. She looked to him. From within the wheel, he nodded, and a thousand tiny lights lit the stage. They were Ukraine, and they were here to restore kitsch. 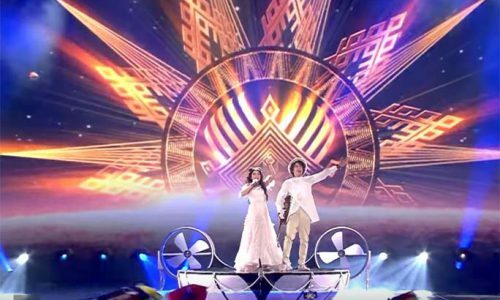 Time was, Eurovision meant something in the world of ironic gaudiness. It was a sacred place—a sanctuary in which the 1970s had never died, the campiness of your costume bespoke your status, and happiness took the form of sequins and potentially hazardous props. Time was, you could find Celine Dion warbling French pop-ballads in a tutu and blazer; ABBA referencing Napoleonic history; Bucks Fizz invoking the moves of Grease. But times changed, and the magnificent badness of Eurovision had begun to wane. Musicians were playing serious songs, with slow tempos and pensive lyrics. Costumes went unsequined, hair unteased. Stage makeup was becoming subtle, understated. And thus did The Resistance decide to make its move. Mariya was her stage name. She had thrown off her true identity long ago, when the dream of fame urged her to reinvent herself as a leather-clad superheroine who wielded tunes in the name of justice. The only thing that remained of her old self was her companion, the young man who had been the sole constant throughout her tumultuous life. Her soulmate, her sidekick, her shadow—the one they called Hamster. Hamster had grown up in the forests of Plötdeviche, born to a secretive people—keepers of the ancient art of wheeling. His family had long been hailed as the greatest of the wheelies, and so honed was his skill that, when he came of age, they had sent him over the Moldovan border to learn the ways of unicycling from his cousin Filuše. Once expert in all the major schools of wheeling, he had set forth into the world, bent on finding his lost love from childhood—she who had cast off her life in the dark forests of Plötdeviche and refashioned herself as Mariya. The music whistled; the lights flared. Mariya whirled to face the crowd and clapped her hands—the signal to begin. How many years they had trained for this glittering stage. Yet there was more to this moment than even Mariya’s dreams of fame had anticipated; their performance was only the fragile veil that covered the truth of this night. The man had appeared on their doorstep the day Mariya and Hamster learned they had been chosen for the glory of Eurovision. Wild of hair and charming of smile, he gave no name—but, without needing to discuss it, Mariya and Hamster ever after referred to him as The Guy From The Resistance. ‘I thought Eurovision was actually a political event, its winners determined largely by current socioeconomic alliances,’ protested Hamster. ‘In good time. First I must explain the purpose of Eurovision—the dark truth we hide behind the lie of…socioeconomic politicking.’ He looked indulgently at Hamster, who sighed and rubbed his eyes. She gasped. Hamster spluttered. ‘How can this be?’ murmured Mariya. ‘A very good question!’ snapped Hamster. He proceeded to rattle off something about atoms, elements, gravity, and a singularity or two, but Mariya and The Guy ignored him. ‘Exactly. For years it kept the kitsch levels high, the world running smoothly. But then The Organisation decided to meddle.’ It was impossible for hate to suffuse those soulful features, but he paused in his strumming long enough to look aggrieved. ‘Ohhhh.’ Mariya and Hamster nodded, understanding. There was always a bad guy. On stage, the time had come. 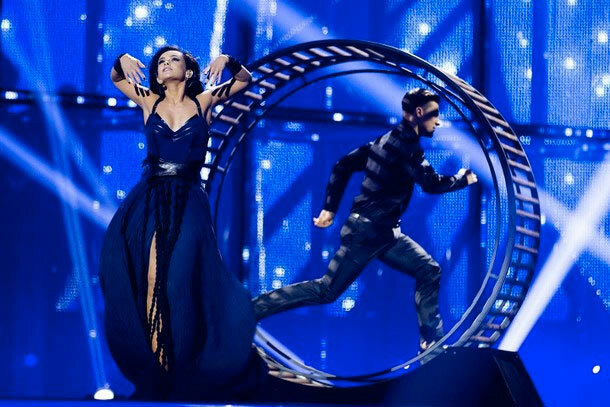 Mariya approached the wheel, praying for success—and also that her fluttering dress wouldn’t get caught in the damn thing. Hamster met her eyes through the spinning slats. ‘They don’t know that you’re miiiiine,’ she sang, and spun the wheel with all her strength. Blue light burst from it, sparking across the stage. Once, twice, and then a third and it was done: they had released three great waves of kitsch energy into the world. With any luck, the crowd would think the light a mere effect—but The Resistance knew the truth. The Tolmachevy Oracles of Russia appeared beside Mariya as she waited backstage. Golden-haired twins dressed in the flowing robes of their virginal ancestresses, they were wise beyond their years. ‘Do you think anybody noticed?’ asked Chevy, sitting on Mariya’s other side. Mariya looked around for The Guy, but could not find him. When she turned back to the table, a cake sat where there had been no cake before. ‘Sweet!’ said Chevy, and began to distribute slices. For they were The Resistance, all that stood between The Organisation and a serious world. They were The Resistance, last hope for unicycles, free alcohol, hamster wheels, and kitsch. They were The Resistance, and they were going to have some cake.